Canada's annualized inflation rate in July was 1.2 per cent, up from 1 per cent in June, largely driven by higher prices for gasoline. Canada's annual inflation rate ticked higher in July as prices for gasoline climbed, giving the Bank of Canada room to raise its key lending rate again in the fall. The annualized inflation rate last month was 1.2 per cent, up from 1 per cent in June, Statistics Canada said, adding the increase was in line with estimates. "Barring a major shock, we believe an October rate hike remains on track," Douglas Porter, chief economist of BMO Financial Group, said after the agency released its numbers Friday morning. He said upward pressure on interest rates will continue in the coming months, based on the modest uptick reported by Statistics Canada in two of the central bank`s three core inflation indices, which exclude volatile items like gasoline. At 9:28 a.m. ET, the Canadian dollar was trading at 79.45 US cents, up 0.8 per cent as traders saw the consumer price index (CPI) numbers as reinforcing expectations that Canada's central bank will continue on its path of rate hikes. Gains for the loonie came even as prices of oil, one of Canada's major exports, edged lower. U.S. crude prices were down 0.19 per cent at $47 US a barrel. In the 12 months leading up to July, prices were up in six of the eight major areas tracked, with the transportation and shelter indexes contributing the most to the year-over-year rise in the CPI, Statistics Canada said. Consumers paid 4.6 per cent more for gasoline in the 12 months to July, helping to drive transportation costs higher by 1.9 per cent, following a 0.6-per-cent increase in June. They also paid more for passenger vehicles, which saw prices increase 0.2 per cent after declining 0.2 per cent the previous month. On a monthly basis, gasoline prices rose 0.2 per cent, so were not a big factor in the CPI, said Porter. "The early read on August is that pump prices will rise about 3 per cent next month, versus a small drop a year ago, which should boost [total inflation] a tad further," Porter said in a statement. The shelter index increased 1.3 per cent year over year in July, after rising 1.6 per cent in June. Homeowners' replacement costs contributed the most to the gain in prices, rising 4.1 per cent in the 12 months to July. Prices for natural gas, up 9.7 per cent, increased at a slower year-over-year rate than they did in June. Meanwhile, the electricity index recorded its largest decrease since April 2003, down 9.1 per cent year over year in July, following a 5.3 per cent decline in June. The decline at the national level largely reflected legislated price declines in Ontario. Consumer prices for food rose 0.6 per cent on a year-over-year basis in July, matching the gain in June. 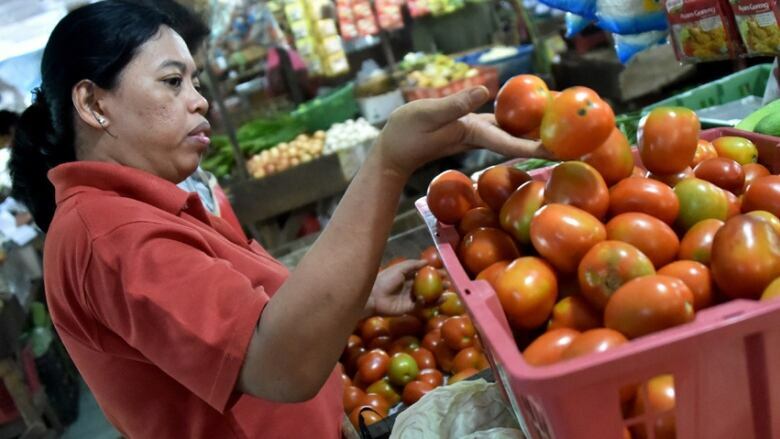 "Food prices have also stopped dragging on inflation … after falling more than 4 per cent [on a year-over-year basis] earlier this year," he said. "And, finally, there are no more cuts in electricity prices announced at this point. Combined with a firmer economic backdrop, these signs suggest that the lows for both headline and core inflation have likely been put in, and both will grind higher in the year ahead. "But, as we have so vividly seen from the mild U.S. inflation outcomes, the emphasis is on a slow grind," Porter said. The household operations, furnishings and equipment index, as well as the clothing and footwear index, declined on a year-over-year basis for the first time since August 2006, down 0.1 per cent. The furniture index contributed the most to this decline, down 2.9 per cent in the 12 months to July. The telephone services index increased 0.1 per cent year over year in July, after rising 2.0 per cent in June. On a monthly basis in July, telephone services prices fell 1.8 per cent. Prices for household appliances were down 2 per cent. Brian DePratto, senior economist at TD Economics, said Canadian inflation may still be modest, but its showing some signs of moving in the "right" direction vis-à-vis the Bank of Canada's 2-per-cent inflation target. Two of the three measures of core inflation that the Bank of Canada introduced last year saw slight gains, Statistics Canada said. The average of the core measures was 1.5 per cent in July, rising from 1.4 per cent in June and 1.3 per cent in May. "After months of deceleration, tick-ups in energy costs (on a year-on-year basis) helped deliver a small gain in price inflation in July. 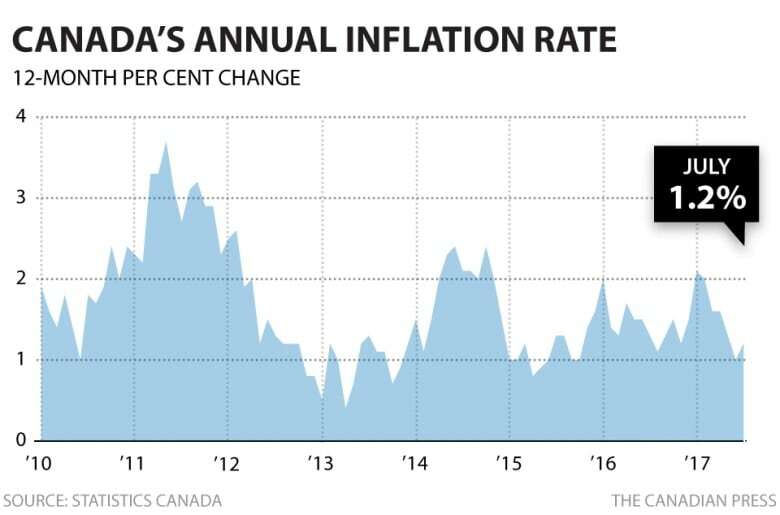 One month is hardly a trend, but the modest increases in the Bank of Canada's core measures provides some hope that inflation may have turned a corner," DePratto said. TD Economics said that, in a reversal from June, inflation for goods ticked upward a bit, albeit to barely above zero per cent, on the back of swings in energy prices. Conversely, services inflation, at 2.1 per cent year-over-year, remains the driver of overall price growth, but decelerated somewhat from June's 2.4 per cent reading.